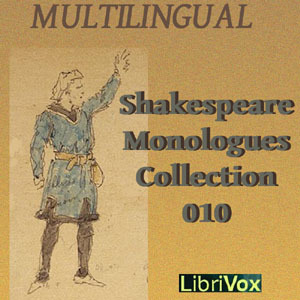 LibriVox readers present the tenth collection of monologues from Shakespeare's plays. Containing 20 parts. William Shakespeare (April 26, 1564 - April 23, 1616) remains widely to be considered the single greatest playwright of all time. He wrote in such a variety of genres - tragedy, comedy, romance, &c - that there is always at least one monologue in each of his plays. Some of these teach a lesson, some simply characterize Shakespeare at his best, some are funny, some sad, but all are very moving. Each monologue will touch everybody differently. Some people will be so moved by a particular monologue that they will want to record it. (Summary by Shurtagal) In a departure from previous collections we are including versions from the many languages to which his works have been translated.